MONOJECT Oral Medication Syringes are clean, single-use polypropylene syringes with separate ribbed tip caps; polypropylene barrel and plunger rod, latex-free plunger tip; dual graduations in milliliters and teaspoons; oral feeding luer tip (WILL NOT ACCEPT HYPODERMIC NEEDLE). 10mL Clear. Easy To Use. Lightweight. Safe. Durable. Easy To Use. Lightweight. Easy Storage. I use these syringes three times a day to assist feed my chinchilla who unfortunately is having some health issues. They are perfect for this task, though they do start to wear out after 5-7 uses. These shipped and arrived quickly and are priced fairly. I would order them again. Easy To Use. Easy Storage. Safe. 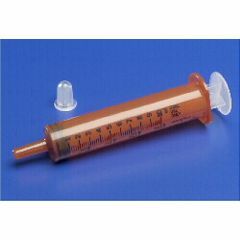 I am using the syringe to feed my two of my cats who have chronic kidney disease. I am overall very happy with the product but a mistake was made with the order and I only got 6 10 ml syringes with the note that stated one more box of 100 10 ml syringes is on its way. I had to contact customer service. Noel Mendoza was most helpful. He saw the problem and took steps to reorder six boxes of the 10 ml syringes for me. Noel Mendoza is to be commended for doing such a great job. I finally got all the syringes yesterday (4-15-13). The description says clear but the picture looks tan or brown. Are they clear? They are not crystal clear but more like translucent like plastic milk carton. You can see the contents. The ones I received were clear.